The focus of my blog is to review book series and not individual novels, but writers are going to continue writing novels within a series even after I have done my review, so I plan on reviewing the individual novels as they come into circulation. 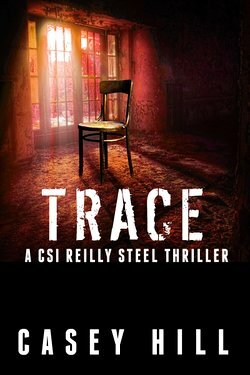 Casey Hill just recently added book #5, Trace, to the Reilly Steel series. Irish authors Melissa and Kevin Hill, aka Casey Hill, have added a new addition to their Reilly Steel series. As I have mentioned in my review of the series, each novel in the series is based on the investigation of serial killers by forensic investigator Reilly Steel and homicide detectives, Chris Delaney and Pete Kennedy. The unique aspect of this series is the bizarre modus operandi of each of the serial killers and the serial killer in Trace is no different. In this novel, the suspect is motivated by food and not just any kind of food but gourmet masterpieces that he likes to serve to his victims which harbor a toxic ingredient. The serial killer’s target are women that are very independent with no time for any extended relationship. Besides the serial killer plot, there are two subplots also taking place throughout the novel. The sister of forensic technician, Lucy Gorman, was abducted and presumably murdered when Gorman was a child. The abduction has been a cold case for many years but new evidence found in a previous novel, The Hidden, has reopened the case. Steele is determined to find the answers so that Lucy and her father, Garda Forensic Units Director Jack Gorman, can find closure. The other subplot involves Reilly Steel’s personal life. In my review of the series, I complained that Steel was just too perfect without any real flaws, well, the halo has tarnished and Steel is knocked off her pedestal. When Steel gets too upset about something, she becomes a bit of a girly girl and runs into the arms of the men that she has developed an attraction with which is getting her into a whole lot of trouble. With this little character flaw, the series will be taking on a whole new angle. Overall this is a nice cozy book to read on a weekend. It would be best to read two earlier novels in the series, The Hidden and The Watched before reading Trace. To learn more about the series check out Casey Hill’s Reilly Steel series. Posted in Forensic Thriller.Tagged Book Review, Book Review Blog, Book Series, Casey Hill, Crime Thriller, Forensic Fiction, Forensic Mystery, Forensic Thriller, Kevin Hill, Reilly Steele, serial killers.